To serve our global customer base, BriskHeat has offices and facilities worldwide including in USA, Vietnam, China, Taiwan, and various locations throughout Europe. BriskHeat has been located in Columbus, Ohio, since its founding in 1949. In 2016, BriskHeat moved into a new 97,800 sq. ft. (9,086 sq. m.) facility. This location is the head office and primary manufacturing location for the majority of BriskHeat products. 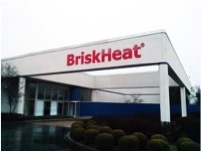 BriskHeat Vietnam, opened in 2010, is a 52,000 square foot (4,827 square meter) manufacturing facility dedicated to production of cloth heating jackets and insulators. BriskHeat Shenzhen is a wholly owned subsidiary of BriskHeat registered in Shenzhen since 2014. BriskHeat provides full services and support to China through BriskHeat Shenzhen, includes stocking of a wide range of BriskHeat products. With its central location, this warehouse allows BriskHeat to provide faster deliveries throughout Europe.